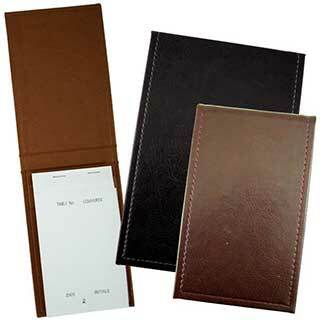 A waiter’s pad cover keeps restaurant order pads neat and tidy and professional looking. We have a large range of waiters pad covers to suit all restaurants, hotels, pubs, cafes, etc. Our waiter’s pad covers are supplied in various sizes, fabrics and colours. 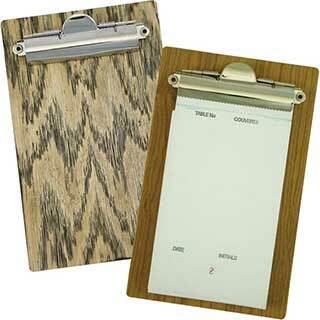 We supply a full range of food service pads/waiter’s pads for any type of establishment. The faux leather waitress pad cover is available in a wide selection of quality soft faux leather colours and is available in two sizes. Available in small size w95mm x h155mm or large size w117mm x h175mm. Colours available: Blue, Black, Bluebell, Bronze, Burgundy, Dark Brown, Champagne, Dark Green, Jade, Lime, Orange, Silver and Tan. Matching Menu Covers, Room Folders, Bill Presenters, etc. available. Faux Leather. Minimum quantity 10. Kensing. Waitress pad cover in textured wood style. These stylish waitress pad covers are manufactured from a soft synthetic wood effect material which has a realistic wood texture. Water resistant fabric. It is available in two sizes small w95 x h155mm and large w117 x h175mm. Wide range of wood textured colours including Charcoal, Grey, Mushroom, Dk Oak, Mink, Rosewood, Cherry Oak, Orange, Burgundy, Dk Blue, Dk Green, Royal Blue, Lt Blue and Yellow. Minimum quantity 10. A full range of restaurant pads are available. 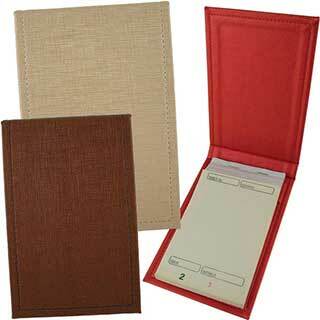 Matching Menu Covers, Room Folders, Bill Presenters, etc. available. Waitress pad cover, wooden clipboard style. 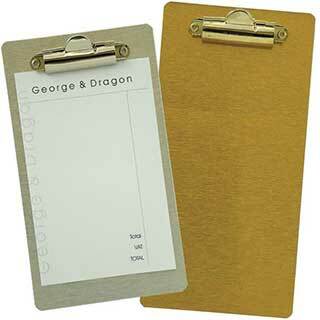 A strong wooden clipboard available in a wide range of colours with a strong metal clip in gold or silver finish. Available in two sizes small w115 x h178mm or large w126 x h200mm. Colours available; Black Ash, Light Ash, Whitewashed, Light Oak, Dark Oak, Maple, Walnut, Mahogany, Cherry, Distressed Oak. Minimum quantity 10. A full range of restaurant pads are available. Matching Menu Covers, Room Folders, Bill Presenters, etc. available. Wooden. 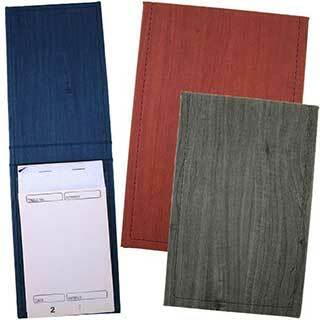 This faux leather waitress pad cover is supplied in a wide range of colours. 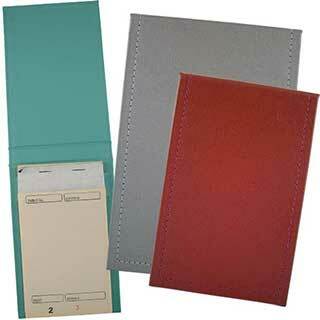 Soft imitation leather in a wide range of colours including Black, Green, Red, Sand, Blue, Light Brown, Burgundy, Dark Brown. A full range of restaurant pads are available. 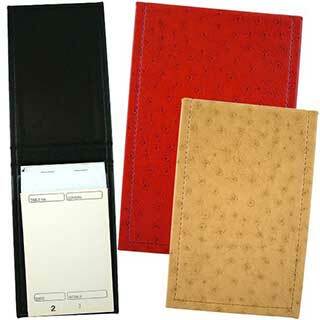 Matching Menu Covers, Room Folders, Bill Presenters, etc. available. Os. The textured fabric waitress pad cover is supplied in a range of colours in a textured cloth. This unique fabric is water resistant with a deep grain making it stylish & versatile. Large textured colour range. Colours available: Black, Bronze, Putty, Metallic Red and Gunmetal. A full range of restaurant pads are available. Matching Menu Covers, Room Folders, Bill Presenters, etc. available. Mon. Strong and robust metal waitress pad cover, available in gold, silver or white. Each metal pad comes with a strong gold or silver clip to hold your paper securely. Hard Wearing (although scratching may occur). Available in two sizes, small size 108mm x 160mm or large size 108mm x 190mm. Colours available are, Gold Siver or White Aluminium. Supplied with a gold or silver clip. Supplied unpersonalised. White aluminum comes with Silver clip as standard. Minimum order 10. A full range of restaurant pads are available. Matching Menu Covers, Room Folders, Bill Presenters, etc. available. Metal Clipboard. The textured buckram fabric waitress pad cover is supplied in a range of bright colours in a stylish textured wipe clean material. Water resistant fabric. Wide range of textured colours including Black, Silver, White, Dark Blue, Light Blue, Purple, Dark Brown, Burgundy, Red, Dark Green, Grass, Green and Beige. Minimum order 10. A full range of restaurant pads are available. Matching Menu Covers, Room Folders, Bill Presenters, etc. available. Buckram.